Spirit Riding Free…A Stable Sleepover Competition! Over the last year or so what Alice chooses to watch on the television has changed, she no longer asks for Peppa Pig and Topsy and Tim. It took us a while to find programmes that were suitable for her age and that she also enjoys. Alice is typical girly girl and one programme that we’ve recently been watching is Spirit Riding Free. It is a show where the running theme through it all is about genuine friendship. It’s about a girl called Lucky and she is a city girl who finds herself living in the country and becoming a country girl. She has two best friends Pru and Abigail and together they have adventures together. Lucky meets Spirit, a wild mustang and she feels an instant connection to this untameable horse. Together they discover what it means to be free….. I asked Alice what it is she loves about the programme and she said that she likes how the friends help each other and the fun they have. Plus Lucky has a best friend called Abigail, just like her. You can watch Spirit Riding Free on POP and its on air now at weekends at 12.30pm. 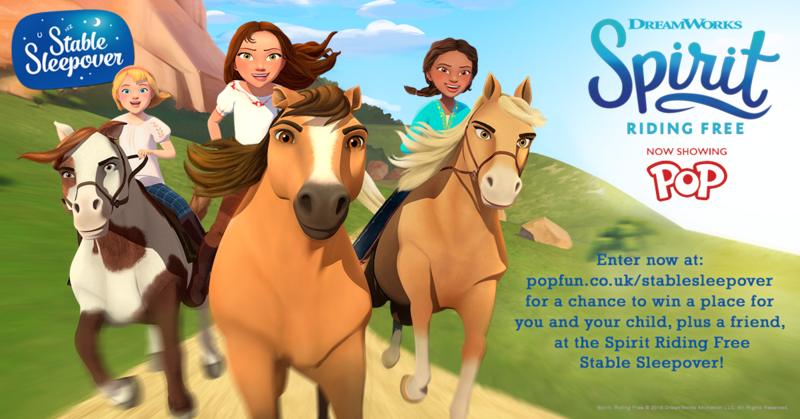 POP have a brilliant competition for you to enter, The Spirit Riding Free Stable Sleepover Competition and it’s an amazing prize. The winners will stay in a converted stable with a friend and enjoy a weekend full of all things Spirit – horse riding, fun activities and crafts, treasure hunts and lots more surprises! I told you the prize was amazing, I bet there are lots of children that would love to win this prize and there will be 3 lucky winners. To enter head over to POP now! It’s the easiest competition ever and I ‘may’ have even given you the answer to the question, but any Spirit Riding Free fan would know the answer anyway. Previous Post: « Being Brave…Go Ape Tree Top Adventure, Bracknell! I have never heard of this programme before. I wonder if the kids would like it. They enjoy watching all sorts. Love the converted stable stay plus horseback riding! Thanks for sharing the opportunity to win this lucky giveaway–plus another option for programming beyond Peppa!